Madison Square Eats, the outdoor street food market situated by Madison Square Park is back again for the Fall season. The market is open from 11am to 9pm and will feature old favourites such as Roberta's Pizza, Asiadog, and my favourite, Arancini Bros., as well as new vendors like Tacotown and Delaney Barbeque. Dining beneath the colourful Marimekko umbrellas with a fabulous view of the iconic Flatiron building makes this a quintessential NYC experience. Also Madison Square Eats is a 10-minute walk from home - you can bet I will be doing no cooking this month. Get the entire vendor list here. It's cool to be a geek so it comes as no surprise that tickets to the New York edition of Comic Con has long sold out. I found out too late too so I am sitting here weeping onto my laptop. If you are amongst the lucky few with these golden tickets, you can expect plenty of cosplayers, panels, screenings and appearances by anyone who's anyone in the comic/ manga/ anime arena. If you don't have tickets, I recommend loitering outside the Javits Center anyway - the people-watching is bound to be even more fabulous than fashion week! Historic landmarks and private residences throughout the boroughs will open their doors to the public in this annual event in celebration of the city's architecture and design. The weekend will see the city putting on guided tour and performances, as well as holding open discussions with architects, designers and artists. Some tours, especially to sites that are usually closed to the public, are ticketed and went on sale late last week. Highlights this year include tours to the 72-story World Trade Center before it opens to the public, the new Whitney museum by the Highline and the extravagant Grand Lodge of Masons. Get the calendar of events and ticketing information here. Columbus Day marks the arrival of Christopher Columbus to the Americas, and thanks to The Sopranos, I now know it's also an unofficial celebration of Italian-Americans. Regardless of what your views are of the voyager and his wrong turns, I welcome any celebration that gives us a day off work! 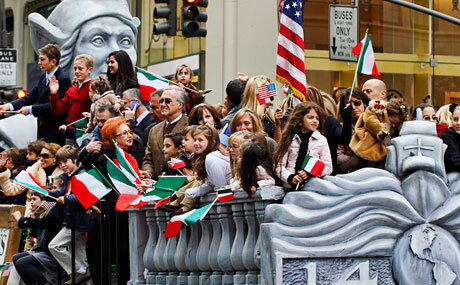 On the 14th, the annual Columbus Day parade will take over Fifth Avenue and Columbus Circle on the southern edge of Central Park. A huge turnout is expected so if you don't like crowds, I suggest staying downtown! New music is the order of the day at the 33rd annual CMJ Music Marathon where over 1300 shows will take place at more than 80 venues across the city. Besides performances, there will be panels, seminars, mixers and parties to commemorate the event. While there will be plenty of industry professionals and musicians in attendance, events are open to music lovers and fans alike. Tickets and details can be found here. If like me, you have yet to visit the Frick, now is your chance. For the next couple of months, the private museum will showcase a rare collection of world-renown Dutch paintings usually only in view at the Royal Picture Gallery Mauritshuis at the Hague, such as Vermeer's Girl with the Pearl Earring, Fabritius' The Goldfinch and a number of Rembrandt works. Large crowds are expected and timed tickets will be needed on top of usual museum admission. 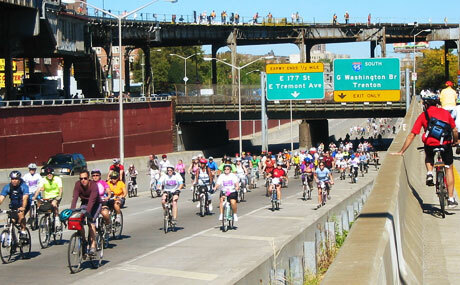 Cyclists will be able to bike without fear of cabs and other traffic yet again with Tour de Bronx. Streets around the 61 neighbourhoods in the borough will be mostly closed, especially the Sheridan Expressway during this free event. Registrations are still open for either the 25-mile or more challenging 40-mile course. I suggest combining this bike ride with a self-guided food tour too! The Halloween Parade was another casualty of Hurricane Sandy last year but is looking to make up for lost time for its 40th anniversary celebrations this month. The parade will take place on Halloween Thursday from Sixth Avenue between Spring Street and 16th Street. Visit here to register as a volunteer or performer but whatever you do, make sure you don a costume! There will be large crowds but it's worth checking out at least once. Hope you enjoy some/all of these events this month. And make sure you have plenty of beer too - it can't be October without Oktoberfest!